A little more than a week ago, I took a walk through one of the restored wetlands here in the Platte River Prairies, enjoying the abundance of wildflowers and other life. Here are a few photos from that walk. You can click on any of the photos to see a sharper version of it. Prairie gentian (Eustoma grandflorum) was blooming in pockets of the wetland. It’s always one of the more striking flowers in wetlands and wet prairies, but it is an annual, so its abundance changes drastically from year to year. 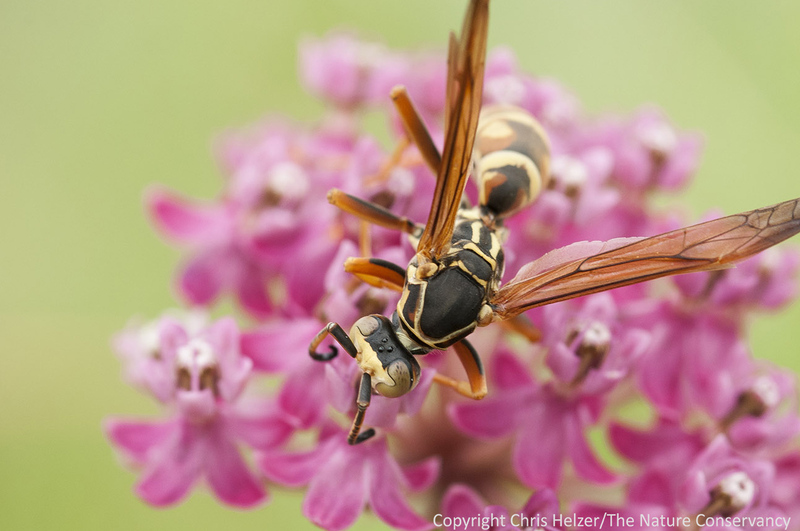 A paper wasp was feeding on nectar from swamp milkweed. I’ll share some more images and a story about this wasp in an upcoming post. 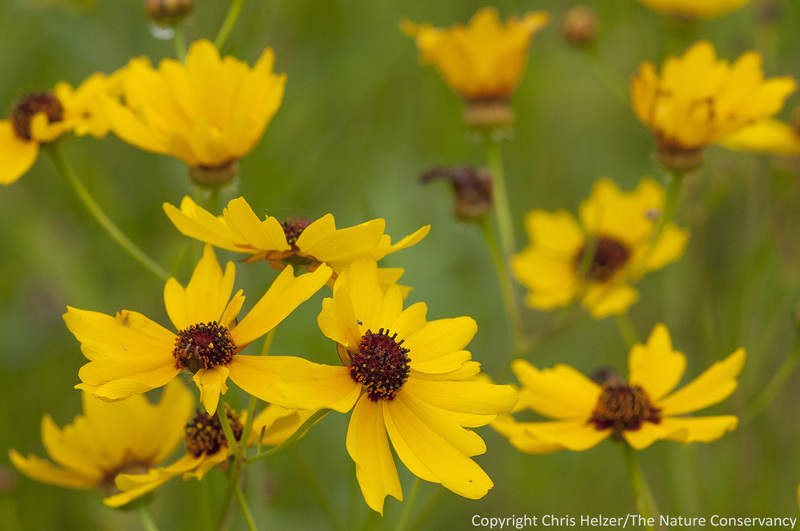 Plains coreopsis (Coreopsis tinctoria) is an abundant annual wildflower in many wetlands in central Nebraska. 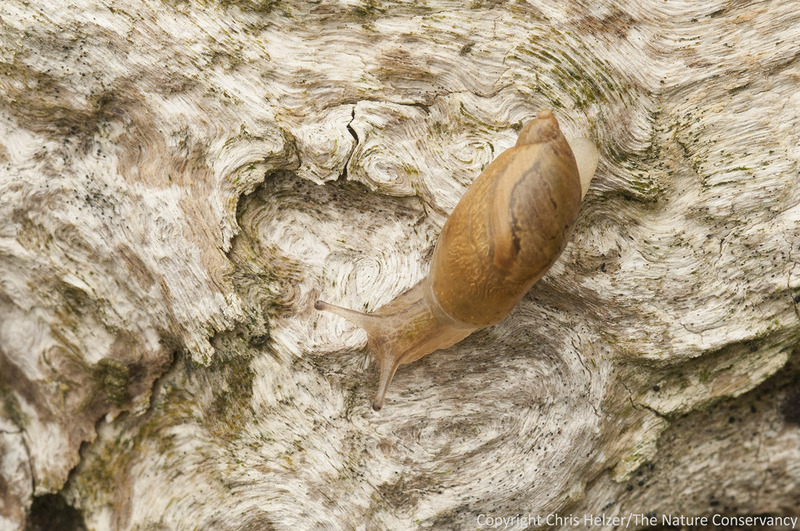 This snail’s shell looked like polished wood as it moved across a piece of driftwood, washed up along the bank of a side channel of the stream. 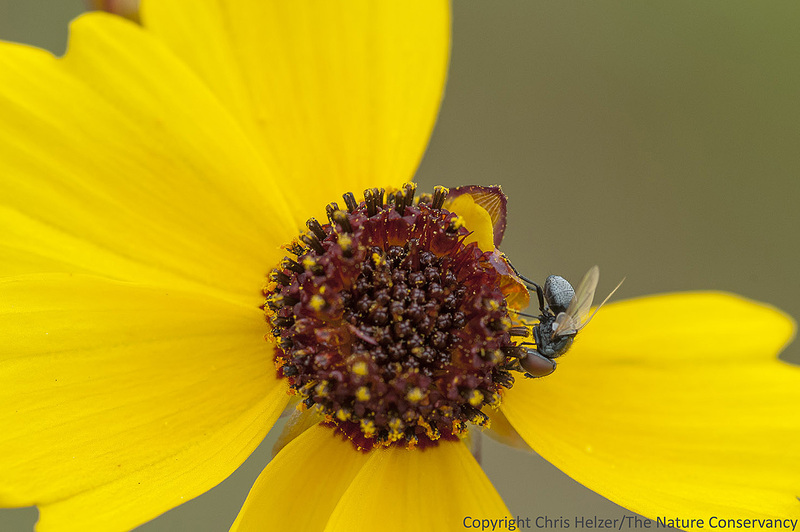 A tachynid fly on a coreopsis flower. 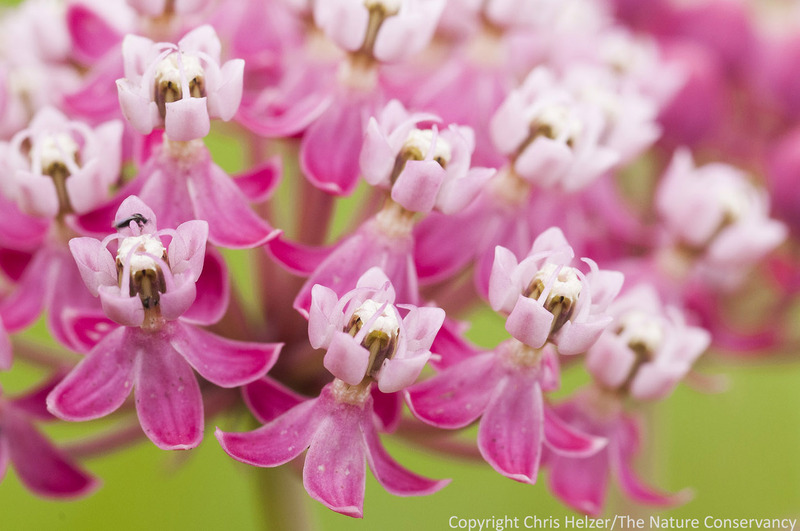 Swamp milkweed is having a great year in our prairies. While it’s a perennial plant, we don’t always see it blooming in abundance. It’s always nice when it does. This week I visited a portion of one of our restored prairies that I hadn’t been to for a while. During the last couple of years we’ve been grazing it fairly hard, so the wildflower displays haven’t been fantastic. I was pleased to see that the rest we’re giving the prairie this year has allowed those wildflowers to do their thing. The site was seeded in 2003, and included a number of excavated wetlands. Portions of the upland seeding came in well and others have some issues, but for the most part, the wetlands look great. 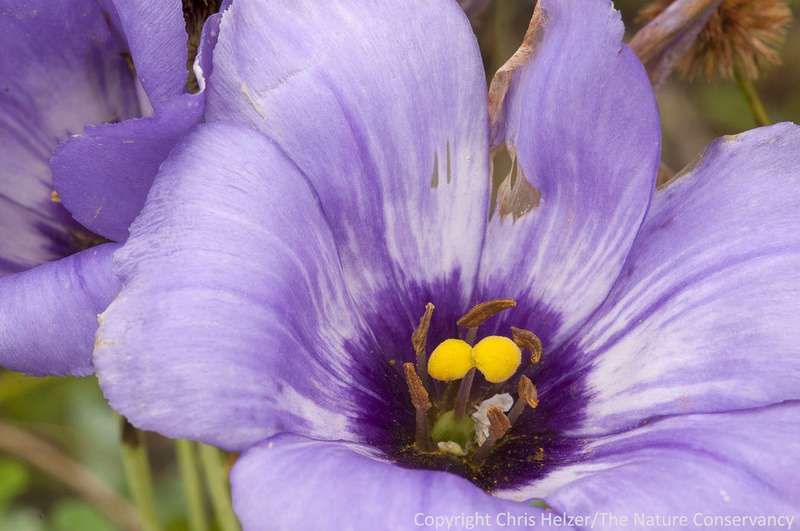 This year, for the second time since we seeded the site, some of the wetlands are experiencing an explosion of an annual plant called prairie gentian (Eustoma grandiflorum). 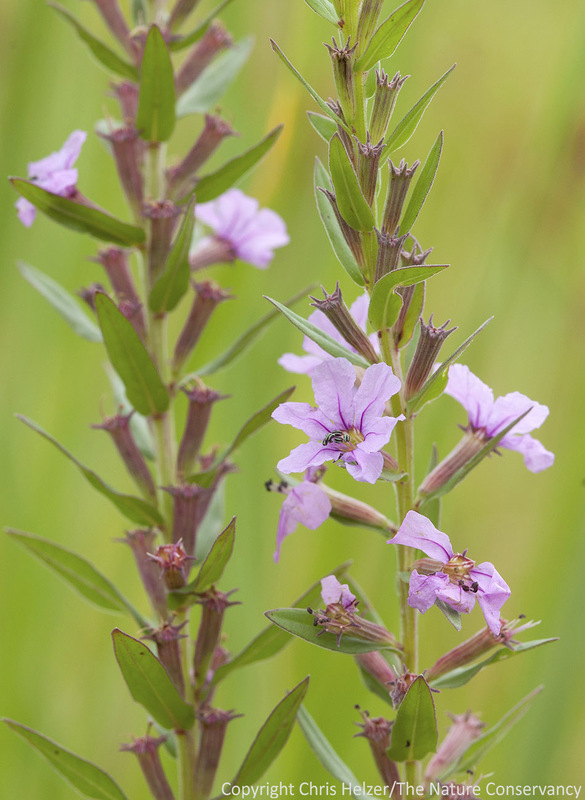 The plant is closely related to, but in a different genus than, the gentian species familiar to many tallgrass prairie enthusiasts. Our gentian is an annual that shows up mainly in wet prairies, with an apparent affinity for alkaline soils. It’s an awfully pretty flower, and when it’s blooming in abundance, makes for a spectacular floral show. Prairie gentian blooming along the edge of a restored wetland slough. The Nature Conservancy’s Platte River Prairies, Nebraska. You can click on this and any of the other photos in this post to see a larger, clearer, version of the image. Click below to see more photos from yesterday morning.